Unai Emery’s honeymoon period at Arsenal seems to be over after a worrying slump in form recently. Following a fine run of 22 games unbeaten, the Gunners now have just three wins in their last eight matches in all competitions – two home wins in the Premier League over Burnley and Fulham, and an FA Cup win over League One side Blackpool. In that run they’ve been convincingly beaten by Southampton and Liverpool, as well as suffering a narrow defeat to West Ham in their last game. 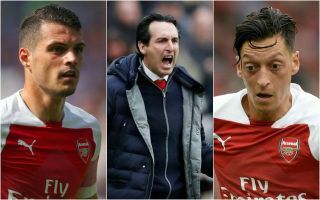 With Manchester United’s revival, a top four spot now looks an even bigger challenge for Arsenal to grab this season, with Emery facing a very difficult job of turning things around. This experiment has gone far enough – Mesut Ozil needs to get back into the Arsenal team ASAP. The German is by no means the best player in the world, and there are valid criticisms to be made of his consistency and work rate. However, no one else in this squad can offer that touch of class and creativity that Ozil does, and Arsenal are not a team that can afford to be messing around with such a top player. If Ozil has already been dropped, how on earth has Granit Xhaka lasted this long? The Switzerland international was pretty poor in his first two seasons at Arsenal, and while he initially showed some glimpses of improving under Emery, it’s just not really happening. Xhaka has far too many lax displays, offering little going forward despite a decent range of passing and the odd long-range goal, and his defensive work is terribly shoddy, often making the costly error that leads to a goal. Joe Willock has looked very promising when given a chance, and Ainsley Maitland-Niles can also play that midfield role. Time to give a youngster a chance if the complicated deal for Denis Suarez cannot be done. Luckily, however, a report from the Mirror today suggests some progress has been made with that, which can hopefully mean the end for Xhaka’s days in the first XI. Easier said than done, of course, but if Arsenal could make just one signing any time in the next year, it would be one of the same influence Virgil van Dijk has had at Liverpool. Or, to use a reference more relevant to Arsenal, like that signing of Sol Campbell all the way back in 2001. As someone very succinctly put it on Twitter this week, Emery currently has a Champions League-level attack at his disposal, but a lower-mid-table defence. The north London giants can no longer try bargain basement options like Sokratis Papastathopoulos, Shkodran Mustafi or Stephan Lichtsteiner at the back – some ambition is needed. Liverpool smashed their club record and made Van Dijk the most expensive defender in history – since then they’ve been transformed, going from a side that shipped almost as many goals as they scored last season to a rock-solid outfit sitting four points clear at the top of the Premier League. It will no doubt take longer for Arsenal to reach that kind of level, with work in other areas obviously needed as well, but it would be an important start. There are surely names out there that seem a bit ambitious – Kalidou Koulibaly, Raphael Varane, Kostas Manolas – but to compete with the top clubs on the pitch again, Arsenal also have to compete with them in the transfer market. Even if it means blowing all their transfer budget in one go, a world class defender and leader like that should be an urgent priority.